Gov. Edwards up-close and personal with Authur “Silky Slim” Reed. Such an action on Jindal’s part largely illuminates why his quest for the Presidency was such a dismal failure. Not only was such an order a huge slap in the face to volunteers who were his most fervent supporters, but it generated animosity among them that Jindal had become ashamed of his heritage and no longer wanted to be associated with them or the Indian heritage at all for fear such an association would not play well toward procuring the nomination for President of the United States in 2016. Slim provides some of the worst “optics” possible for Gov. Edwards at the EBRP Council Meeting of July 2017. CLICK HERE for U. S. Senator John Kennedy’s take on $9,800 of BRAVE money being allocated to Slim by current EBRP Mayor-President Sharon Weston Broome, whom Gov. Edwards heavily endorsed in last year’s race for EBRP Mayor-President. 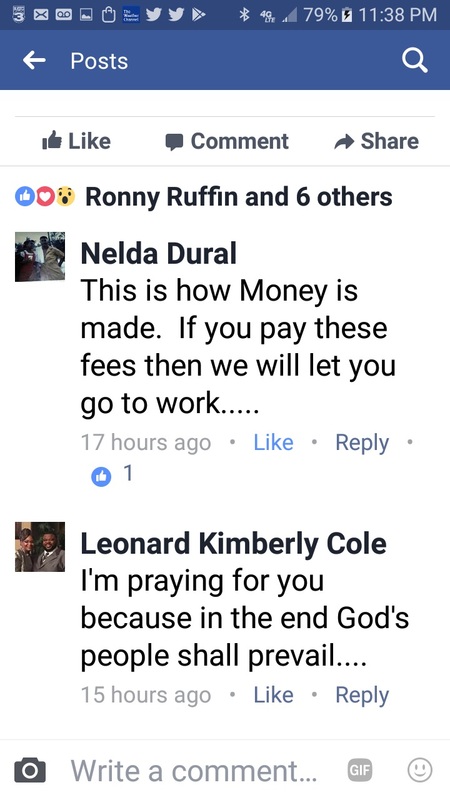 Slim, in demanding the resignation of former EBRP Mayor-President Melven “Kip” Holden, curses the very God he claims he now serves after having become a Christian upon release from his prison sentence. Slim provides yet more “bad optics” for Edwards in an 8/10/17 meeting of the EBRP Metro Council. Despite Gov. Edwards being in possession for over a year of a report by the Louisiana State Trooper’s Association calling for Edwards to remove Commissioner Calvin Braxton from the Louisiana State Police Commission for seeking preferential treatment for his daughter’s DWI, to include insisting that the trooper be reassigned to New Orleans for a period to “get his head right,” Braxton boldly proclaims, “The Governor did what he did. I’m still here.” CLICK HERE for more on Edwards’ Braxton debacle. Despite Rev. 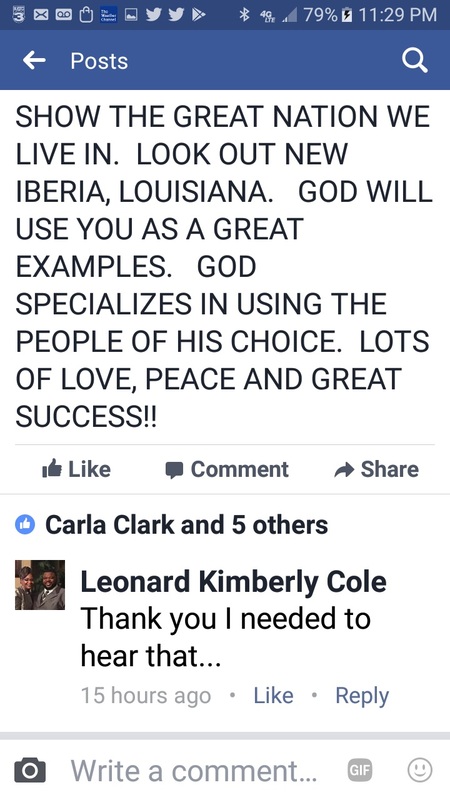 Freddie Lee Phillips being an ordained minister who has served as pastor of Jehovah Ministries in Baton Rouge and, in sharp contrast to Slim, has NO criminal record whatsoever, Gov. 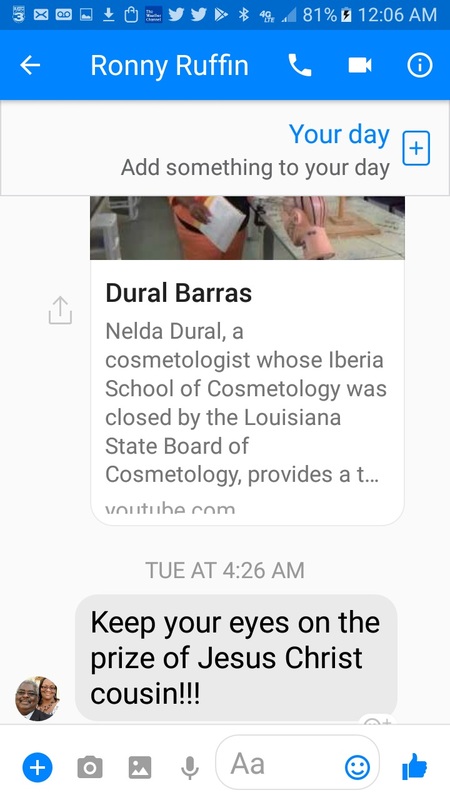 Edwards stands by and permits appointees of his to the Louisiana State Board of Interior Designers, led by Chairman Deborah Steinmetz, to continue a long-standing pattern of VERY OBVIOUS racial profiling. CLICK HERE for Rev. Phillips’ thoughts on Edwards’ IDB appointees. On May 9, 2016, Gov. Edwards provides a TOTALLY FALSE explanation for why he terminated Rev. Phillips from the Auctioneer Licensing Board merely 20 days after having appointed him [appointment: 4/20/16 termination: May 5, 2016]. CLICK HERE to see what REALLY transpired behind the scenes to prompt Edwards to terminate Phillips from the Board. 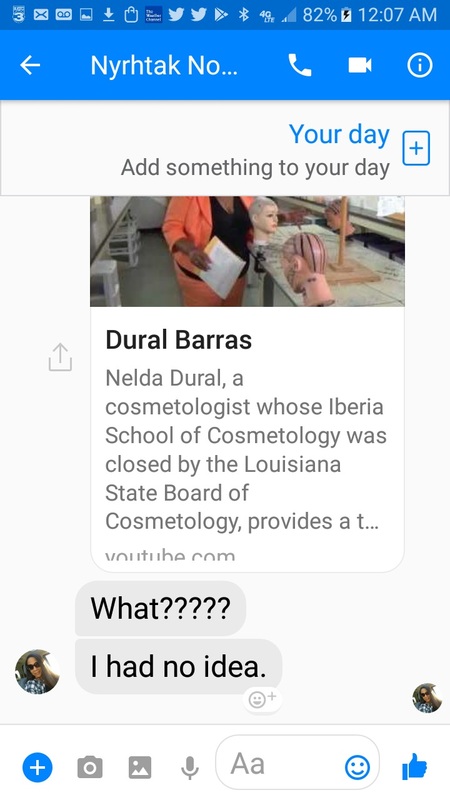 Dural provides tour of her closed-down Iberia School of Cosmetology. McGrath, Kay, and Rep. Emerson fought hard to pass Emerson’s HB-468, which would have freed hair braiders, who are predominantly, if not exclusively, African American, to practice their trade without the need for a license just as the Institute for Justice has been able to achieve in other states all over the nation. However, for those who may not be aware, Sen. John Alario, “R” – Westwego, held that bill and others hostage in attempting to cram Edwards’ budget down Louisiana House Republicans’ throats. 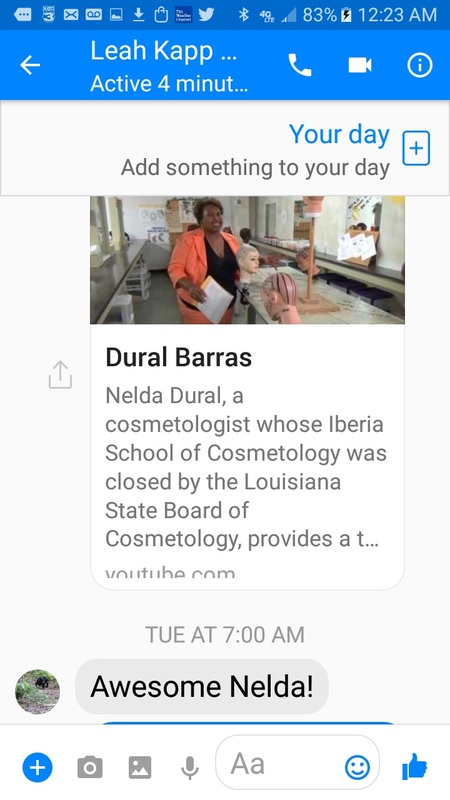 It’s just another instance of Edwards and Alario being willing to stifle economic opportunities for minorities while publicly stating how much they strive to help the same groups, and frankly, Dural states that much better than we can, so we’ll let her do the talking as she emphatically does in the video above. 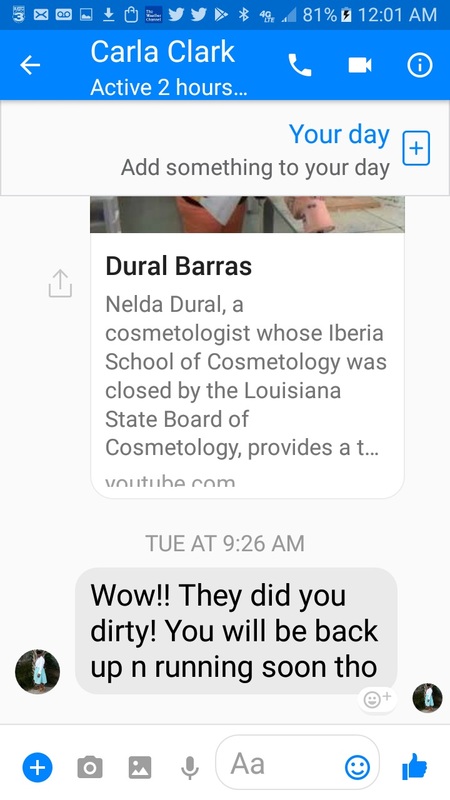 It’s time for the John Bel Edwards’ administration to make the prior administration’s wrongs against individuals like Ms. Dural right. Good people like this should not have to continue to hang. FIRST OF ALL I WOULD LIKE TO THANK THE LORD FOR ALL HIS BLESSING UPON THIS NATION. AMERICA IS STILL THE GREATEST NATION TO LIVE. WE DO HAVE OCCURRENCES WHICH HAVE ATTEMPTED TO DESTOY US FROM WITHIN;BUT, WE ARE BIGGER THAN THAT. WE ARE BIGGER THAN ANY FORCE THAT TRY TO TELL US WHO WE ARE NOT. WE HAVE TO UNITE FOR THE GOOD OF ALL MANKIND. DO NOT LET EVIL FORCE OVERRULE WHAT IS GOOD FOR ALL. I CHALLENGE YOU TO STAND UP AND LOOK EVIL IN THE EYE AND MAKE THE WORLD A BETTER PLACE. WE ALL HAVE BEEN LIED ON AT ONE TIME OR ANOTHER, I BEG YOU TO RISE UP AND BECOME A BETTER PERSON FOR THAT WHICH YOU HAVE SUFFERED. THERE WAS A MAN WHO COMMITTED NO WRONG, YET HE CHOSE TO SUFFER FOR MY SON AND YOURS. HE COULD HAVE CALLED TEN THOUSAND ANGELS TO DEFEND HIS CAUSE. INSTEAD HE LOOK DOWN AND SAW A PEOPLE WHO NEEDED HIS LOVE. THIS IS WHY HE ALLOWED THEM TO HANG HIM WIDE AND STRETCH HIM HIGH. HE KNEW THAT ONE DAY WE WOULD BE ASKED TO MAKE A SACRIFICE TO BETTER THE LIVES OF OTHERS. HE FORGAVE THOSE WHO PERSECUTED HIM FOR THE LOVE OF THE FATHER. I AM NOT ASKING YOU TO GO AND HANG OUT WITH EVIL. I AM ASKING YOU TO REFUSE TO ALLOW THE EVIL OF OTHERS TO DEFINE WHO YOU ARE. KEEP HOPE ALIVE. DO NOT ALLOW THE DARKNESS TO OVERSHADOW YOU DREAMS. GOD HAS GIVEN EVERY MAN DREAMS AND TATLENT. SOME HAVE GREATER TALENTS AND DREAMS THAN OTHERS. WORK WITH WHAT YOU HAVE BEEN BLESSED WITH. DO NOT BECOME JEALOUS AND ENVIOUS OF YOUR BROTHER. ALWAYS FIND A GOOD WORD TO SHARE AND FIND A GOOD WORK TO PUT YOUR HAND TO. THERE ARE STILL A LOT OF GOOD PEOPLE OUT THERE WHO WANT TO SEE YOU DO GOOD IN THE LAND OF THE LIVING. DO NOT SETTLE FOR DEEDS WHEN THERE IS A RIVER FLOWING WITH MILK AND HONEY. IT IS THERE FOR EVERYONE. I DID NOT SAY IT IS FREE. YOU HAVE TO WORK FOR IT. YOU HAVE SWEAT SOME HARD TEARS TO PRAVAIL;BUT, THE LORD WILL DISPATCH THE ARMIES OF ANGELS TO WORK ON YOUR BEHALF WHEN YOUR PLANS ARE HIS PLANS. NO EVIL CAN SHUT DOWN THE PLANS GOD HAS FOR YOU. YOU MAY HAVE WHAT SEEMS TO BE A SETBACK. IT IS ALL A PART OF THE PLAN OF GOD AND HE WILL CAUSE THAT SITUATIONS TO WORK FOR YOUR GOOD. JOSEPH DID LIKE THE PIT EXPERIENCE AND BEING SOLD INTO SLAVERY. HE USED IT TO HIS GOOD AND GOD CAUSES THE KING TO FAVOR HIM. DO NOT GET DISCOURAGED!!!! !COUNT IT ALL JOY WHEN YOU ARE LIED ON. THIS WILL WORK ON YOUR FAVOR AND BRING YOU BEFORE GREAT MEN AND OTHER NATIONS TO BE A BLESSING TO OTHERS. YOU WILL BE BLESSED IF YOU KEEP YOUR HEART CLEAN. DO NOT ALLOW OTHERS STOP THE GREAT BLESSINGS GOD HAS FOR YOU. I THANK GOD FOR ALL THE GREAT MEN AND WOMEN HE HAS ALWAYS CAUSED TO POUR ABUNDANTLY INTO MY LIFE. I WILL CONTINUE TO BLESS AND BE A VESSEL GOD CAN USE. I THANK GOD FOR THE ANOINTING TO HELP HEAL AND DELIVER THROUGH THE TALENTS HE HAS BLESSED ME WITH. IT IS TIME FOR ME TO GET BACK TO THE PLACE HE HAS ALREADY ESTABLISHED BEFORE I WAS CONCEIVED IN MY MOTHER’S WOMB. 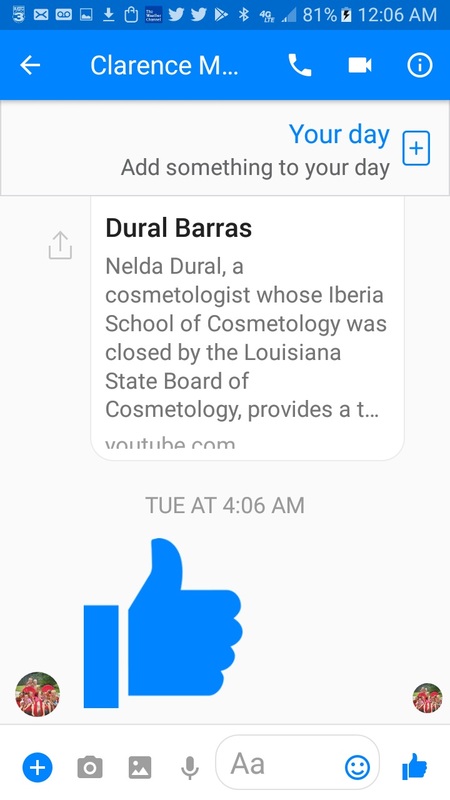 I ENJOYED THE BREAK, I WAS USED FOR MY GOOD, THAT I WOULD ALWAYS KNOW THAT, IT IS GOD WHO CAUSED MY GOOD TO COME ABOUT AND NOT Nelda Dural. HE CAUSES THE SUN TO SHINE IN OUR LIFE. KEEP SHINNING, YOUR DAY WILL COME. DO NOT GROW WEARY. KEEP LOVE IN YOUR HEART FOR ALL MAN. DO NOT ALLOW THE COLOR OF YOUR SKIN TO DIVIDE US ONE FROM ANOTHER. LOVE ALWAYS TRUMPS HATE. 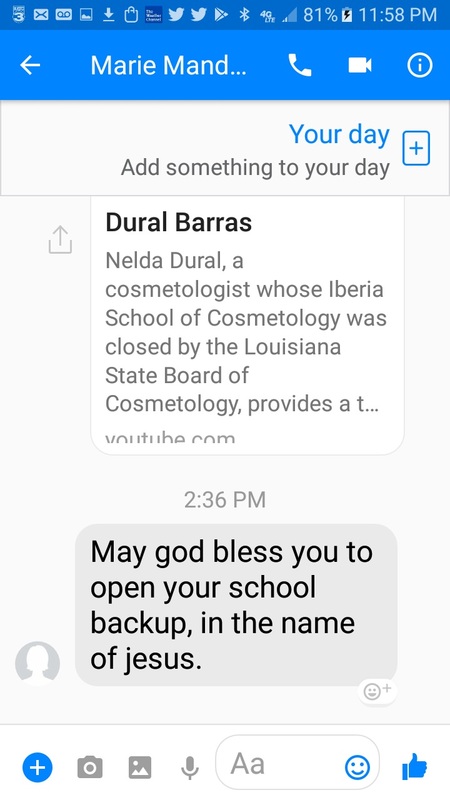 THANK GOD FOR MY COSMETOLY AND MASTER INSTRUCTOR ‘S LICENSE AND I LOOK FORWARD TO IBERIA COSMETOLOGY BEING FULLY RESTORED AND BLESSED. IT WILL BRING PEOLPE BOTH FAR AND NEAR TOGETHER TO SHOW THE GREAT NATION WE LIVE IN. LOOK OUT NEW IBERIA, LOUISIANA. GOD WILL USE YOU AS A GREAT EXAMPLES. GOD SPECIALIZES IN USING THE PEOPLE OF HIS CHOICE. LOTS OF LOVE, PEACE AND GREAT SUCCESS!! I’m praying for you because in the end God’s people will prevail. This is how Money is made. If you pay these fees then we will let you go to work. What the LSBOC has done is a hypocrisy to the art of cosmetology and those who love the art of practicing it. I will say they chose the wrong one to mess with when they decided to try and challenge Nelda Dural. 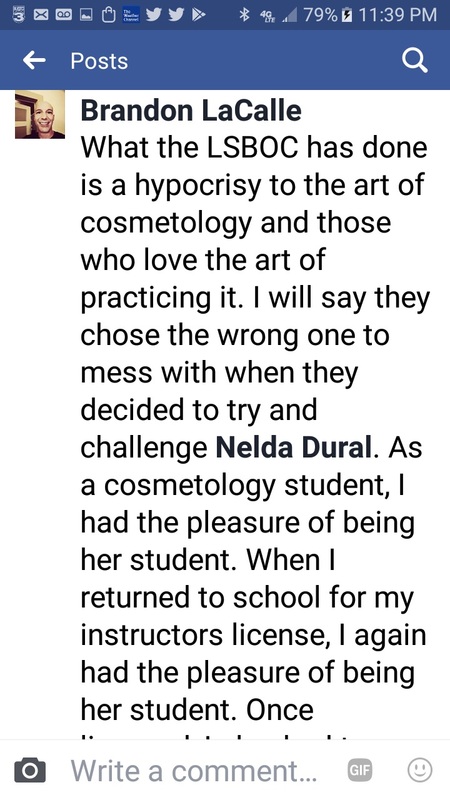 As a cosmetology student, I had the pleasure of being her student. When I returned to school for my instructor’s license, I again had the pleasure of being her student. Once licensed, I also had the priviledge to be her employee for a while. 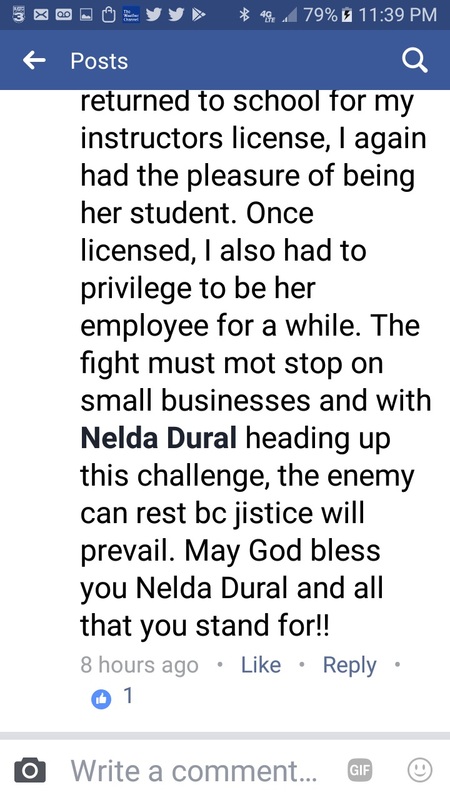 The fight must not stop on small businesses, and with Nelda Dural heading up this challenge, the enemy can rest b/c justice will prevail. 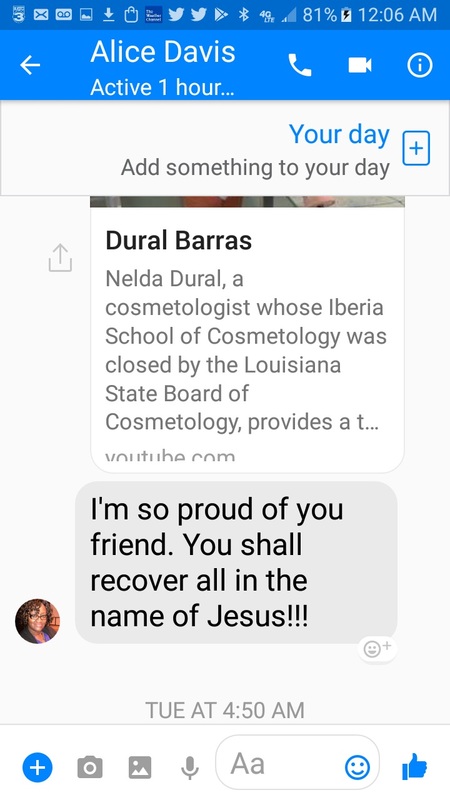 May God bless you, Nelda Dural, and all that you stand for. May God bless you to open your school back up in the name of Jesus. I’m so proud of you friend. You shall recover all in the name of Jesus. 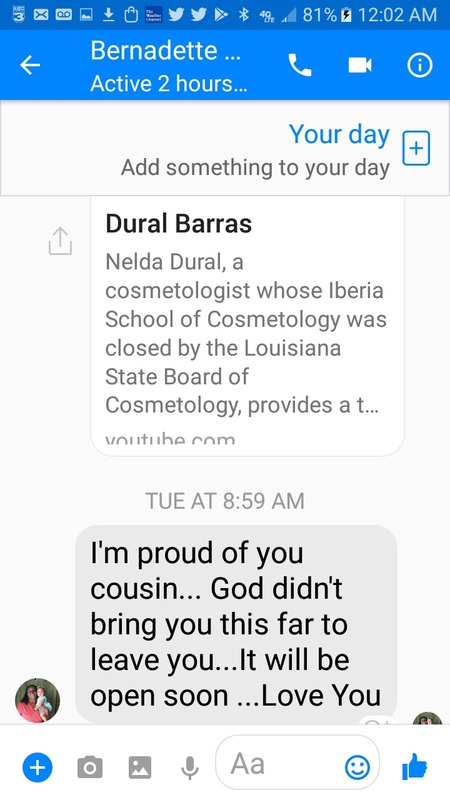 I’m proud of you cousin….God didn’t bring you this far to leave you….It will open soon….Love you. Wow!! They did you dirty! You will be back up n running soon tho. 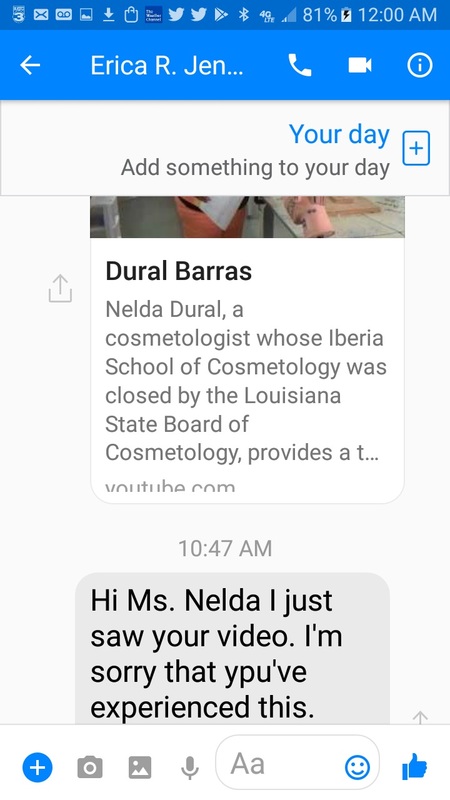 Hi Ms. Nelda I just saw your video. I’m sorry that you’ve experienced this. What???? I had no idea. 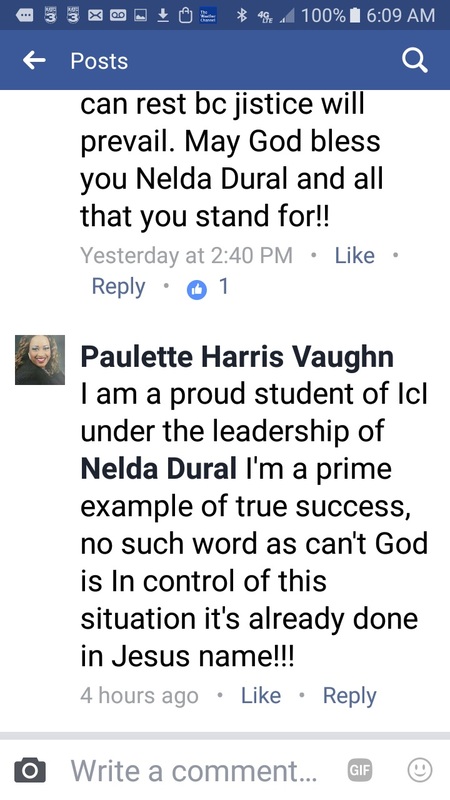 I am a proud student of lcl under the leadership of Nelda Dural. I’m a prime example of true success, no such word as can’t. God is in control of this situation it is already done in Jesus name!!! Keep your eyes on the prize of Jesus Christ cousin!!! Previous Previous post: Rep. Steve Carter, confronted on harsh words for his tax proposal opponents, merely pivots to how long he’s been a Republican. Next Next post: U. S. Rep. Garret Graves calls former Sen. Vitter’s 11% DOTD efficiency claim “sound,” while Commissioner of Administration Jay Dardenne readily admits to “not knowing” what the number is.